Heritage at Vizcaya is a 55+ community located in Round Rock, Texas. This 632 single-family home neighborhood developed and built by Taylor Morrison is part of the larger master-planned all-ages Vizcaya community that will have 1,200 homes upon completion. The community gives homeowners over 20 models to choose from in an area teeming with recreational opportunities while being in proximity to the downtown Austin area. Heritage at Vizcaya will feature all of the amenities, recreational opportunities and home styles to please any active adult in Round Rock, Texas. Heritage at Vizcaya features many of the amenities sure to please any active adult looking for social activity and physical fitness. The private 6,500 square-foot clubhouse is where residents have access to a fitness center with a variety of exercise equipment in addition to an aerobics and dance studio for experimenting with a new workout regimen. The clubhouse also features meeting rooms, an open catering kitchen, billiards and card rooms so that residents can make the most out of community gatherings. Outdoors, active adults can take advantage of the beautiful year-round Texas climate with an outdoor pool and patio for relaxing while tennis, pickleball, and bocce ball courts will be on hand for challenging neighbors to some friendly competition. Additionally, Heritage at Vizcaya will feature many outdoor social events with an event lawn, fire pit, dog park and a BBQ area. There are also walking and biking trails along the greenbelt for enjoying the beautiful Central Texas climate. The homes in Heritage at Vizcaya are offered in three series with over 20 models designed for the active adult lifestyle. These plans will range in size from approximately 1,500 to over 3,000 square feet with two to four bedrooms, two to three bathrooms, and an attached two to three-car garage. The models at Heritage at Vizcaya will have desirable features like open floor plans, spacious owners' suites, gourmet kitchens, and a further selection of personal customizations. The Landmark Series provides seven home models to choose from. These homes range from 1,344 to 1,801 square feet with two bedrooms, two bathrooms, and an attached two-car garage. All of the homes provide desirable one-level living and include spacious owner's suites with extra-large walk-in closets and master bathrooms. Additional features in some models include optional basements and gourmet cook's kitchens with islands, bars, and walk-in pantries. The six homes in the Summit Series range from 1,728 to 2,168 square feet, all on one level. The homes include two or thee bedrooms, two or three bathrooms, and an attached two-car garage. Many models include luxurious owner's suites with bay windows, expansive walk-in closets, and extended walk-in showers and soaking tubs. Additional features include spacious outdoor living areas, gourmet kitchens, and elegant gathering rooms with fireplaces. With the most spacious homes available, the Pinnacle Series includes seven models designed with upscale features in mind. These homes range from 2,106 to 2,825 square feet with two to four bedrooms, two to three bathrooms, and attached two or three-car garages, all on one spacious level. Desirable features in many models include master suites with long walk-in closets and en suite bathrooms with french door entry. Additional options in some models include open floor plans, spacious studies, covered patios, bedrooms with walk-in closets, and storage space. Heritage at Vizcaya features a full-time lifestyle director constantly planning fun and exciting events for homeowners to stay social and physically active. Enjoy the outdoors with friends and neighbors with tennis, pickleball and bocce ball. Residents at Heritage at Vizcaya can also have a relaxing afternoon with card games, arts and crafts and billiards. As the community grows, there will be plenty of activities being planned within Heritage at Vizcaya. 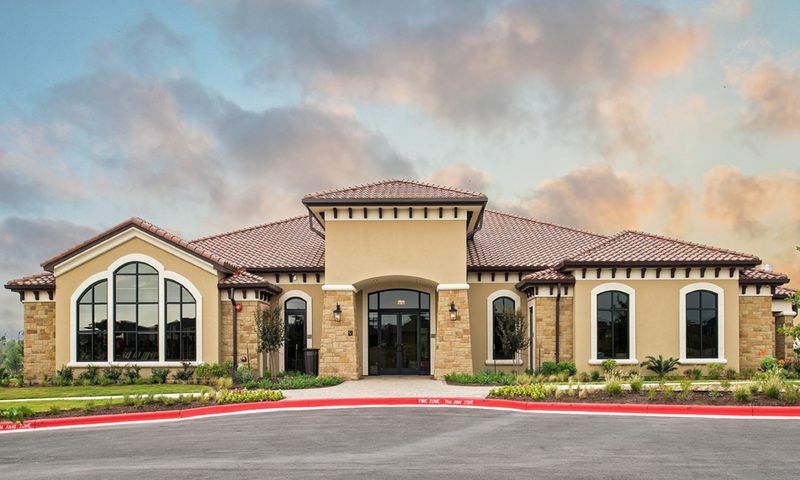 Heritage at Vizcaya is located off of University Boulevard in the city of Round Rock, Texas. It is part of Vizcaya, a master-planned community. Just down the street, residents can find several health care providers, including Baylor Scott & White Medical Center, Seton Medical Center, and Texas A&M Health and Science Center. The Texas State University-Round Rock Campus and Austin Community College are both just down the street. The Round Rock Premium Outlets, IKEA and Cinemark movie theater are all less than four miles away off of Interstate 35. Golfers will love that the Teravista Golf Club is down the street while outdoor adventurists will find plenty to explore in the Southwest Williamson County Regional Park. Austin-Bergstrom International Airport is approximately 30 miles from the community. There are plenty of activities available in Heritage at Vizcaya. Here is a sample of some of the clubs, activities and classes offered here. The Landmark Series offers residents seven models to choose from ranging from 1,344 to over 1,800 square feet. These homes will have two bedrooms, two bathrooms and an attached two-car garage. The Summit Series features six models ranging in size from 1,728 to nearly 2,200 square feet of living space while offering two to three bedrooms, two or three bathrooms and an attached two-car garage. The Pinnacle Series features the largest homes at Heritage at Vizcaya with approximately 2,100 to over 3,400 square feet of living space. These homes offer two to four bedrooms, two or three bathrooms, and an attached two to three-car garage, making the Pinnacle Series a terrific option for those who require more space. We feel lucky to have landed at Vizcaya Heritage. What a really great neighborhood with a fantastic group of homeowners. While working with the builder to make sure our home was what we wanted, we had no problem finding someone to help with our few concerns. Once we moved in, we found even more enjoyment out of our community than we had originally expected. We love it here and look forward to watching Vizcaya grow with more homes and neighbors. We just celebrated our one year anniversary here and I could not be more pleased. Our home is beautiful; the workmanship has been very good. When I have requested service assistance, I have been pleased with the turnaround time. I love the neighborhood and our neighbors are great! The amenities are wonderful - you can choose to participate in some - decline others. There is plenty to do (or not do) for everyone. I have never lived in such a friendly place. I HIGHLY recommend our wonderful neighborhood!!! Extremely disappointed in the quality of the workmanship and Products we paid at highly upgraded prices. Upgraded cabinet quality terrible/ had to have replaced and still not what we upgraded for as far as quality and expense. Living here over one month now and having serious issues on our expensive white granite tops turning orange, sloppy stucco painting framing and facia and many other issues. The yard grading is improper as our neighbors sprinklers and gutters flood our backyard . Every day I have to wait for someone to come repair one of the 25 issues that quality control did not oversee . if you do buy here, go with the only the offered basic yuck they offer so that you could rip out all the cabinets and the granite and replace them yourself. They claim they exceed your expectations but they fall way below ours! Buyer beware! The people and the activities are great, but the construction is sloppy and the customer service to get things fixed is poor. In fixing one of my items during the 1-year warranty, they ruined the bottom of a bathroom cabinet. When I brought that to their attention, they said it must have been an occasional "houseguest"! And we'll need to fix ourselves some of the painting/staining issues that the superintendent kept shrugging off. Beautiful Homes and very friendly! Very nice community with an incredible clubhouse and well-designed homes. 55places.com is not affiliated with the developer(s) or homeowners association of Heritage at Vizcaya. The information you submit is distributed to a 55places.com Partner Agent, who is a licensed real estate agent. The information regarding Heritage at Vizcaya has not been verified or approved by the developer or homeowners association. Please verify all information prior to purchasing. 55places.com is not responsible for any errors regarding the information displayed on this website.